Karen Jones carefully cleans the map’s surface. 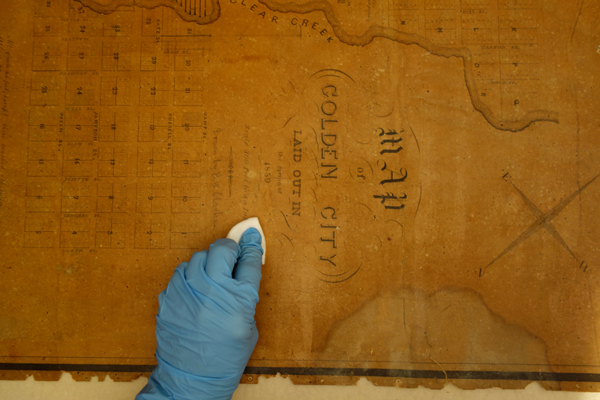 Last summer, while working in off-site storage I literally uncovered an 1859 Golden City map wrapped in tissue paper. It was in fair condition, mounted to cardboard with a newspaper backing. It showed evidence of water damage, the upper left corner was missing and the entire perimeter was covered with nail holes. There was no documentation or record on file, so I spent some time looking for clues, researching its background, and confirming the map’s authenticity. Colorado Gold Rush era maps are rare and it turns out we have the real deal. This is easily the earliest known map of Golden in existence (surpassing Berthoud’s 1864 map of Golden by five years). This priceless map predates the establishment of the Colorado Territory, Jefferson County and Golden City governments. Best of all, it showcases elements from a past landscape, a vision for the future and the entrepreneurial spirit of town-building. A legend in the lower left corner designates the two different developers: Clarke & Co. and Cheney & Snow, men who clearly hoped to make money speculating real estate. Clarke & Co. were in the lumber business too, and it’s fitting that their sawmill operation is prominently displayed on the east edge of town where Coors and Schueler would later build their Golden brewery. These early town-builders were also forward-thinking. The legend shows that they set aside lots specifically for women-it’s unclear if they were given away or not – both a nice gesture and to them, an indisputable mark of civilization. Clear Creek is drawn as a single channel, rather than the wider delta that shows up in later Golden maps, the result of major flooding in the 1890s. Golden’s main north-south arteries are in place, including Washington Avenue, Ford and East Streets. The north-south streets west of Washington are named after the wives of early pioneers. Today’s Illinois Street was originally named Mary Street after Mary Boyd while Maple Street was once Helen Street after Helen Berthoud. A public square is shown between 16th and 18th Streets just west of Washington, a rather neglected public space that existed until the 1950s when the land was sold to Jefferson County for a new courthouse and jail. The site is now part of the Colorado School of Mines campus. 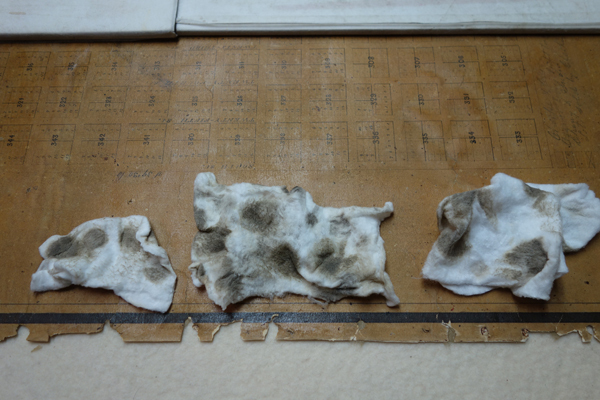 Over 100 years of dirt and grime. Historically and monetarily the map is priceless, so late last year it was earmarked for a conservation evaluation. With support from the Greenwood Fund, we asked paper conservator Karen Jones to examine the map early this year. A conservation treatment plan to remove the matte board backing, clean the surface and re-house the map in a protective enclosure started in May. A high-resolution digital version of the map is viewable thanks to a cooperative arrangement with the Denver Public LIbrary. It’s exciting to make such a find, and the excitement continues as we reveal and document more pieces from Golden’s ever-changing landscape. If you’d like to support other conservation efforts please let us know.